In 1910, Andrew Morris, his wife and children were living in Ray City, Ga in a rented house on Jones Street. Andrew and Louvena Morris had been married 11 years. He could read and write, she couldn’t. Their neighbors were Ray City People: Register, Robert C and William Cole. Andrew worked as a machinist at a shingle mill. Wood shingles were the common material for roof construction at the time, and most houses in Ray City probably had wood roofs. Cypress was the preferred local material, and in 1909 the price of cypress shingles in Georgia averaged about $4.00 per thousand, while pine shingles sold for half that amount. A cypress shingle could last for up to 18 years. In examining the attic of the circa 1903 house at 507 Jones Street, Ray City, GA many old cypress shingles were found. The rafter and stringer construction of the roof framing were clearly spaced to receive the wooden shingles. Old photographs and family history indicate that the wood shingle roof was replaced with a tin roof sometime before 1950. 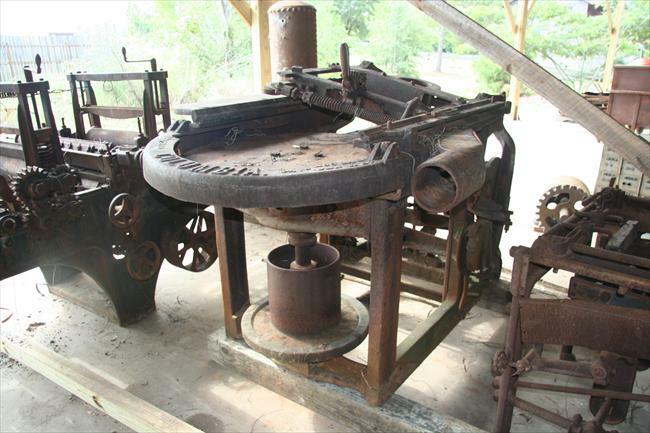 Andrew Morris may have worked on a steam powered shingle machine such as the one owned by the Georgia Agrirama Museum, Tifton, GA pictured below. This 1911 advertisement shows how the machine would have looked when new. 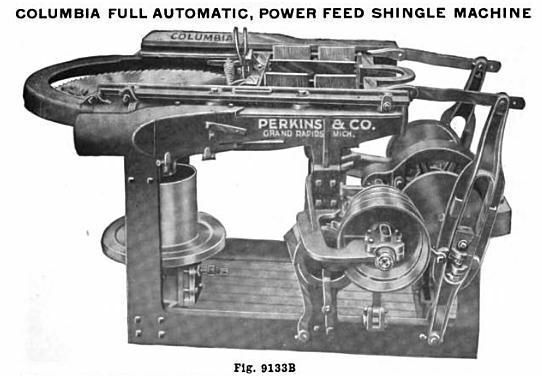 The “Columbia” shingle mill was made by Perkins and Co. from Grand Rapids, MI. The shingle machine had a 36 inch diameter horizontal saw blade. The blade guard displays raised lettering with the company name, location, and patent dates. What became of Andrew Morris? I have recently had a brick brought into the Berrien Historical Foundation office on which the name D A Morris has been inscribed in a script type signature. The closest possibiltiy of anyone listed in the circa 1900 census is Andrew Morris. that sounds like an interesting artifact. According to the WWI draft registrations for Berrien County, Andrew Jackson Morris had moved from Ray City to Nashville, GA by 1918. He worked there as a farmer, employed by Francis Soloman. By the time of the 1920 census, Andrew Morris had moved his family to Porterdale, GA where he and his daughter May Belle worked at the cotton mill. Before 1930, the Morris family moved back to Nashville where Andrew returned to farming on his own account, with all of his sons assisting with the farm labor. Andrew J. Morris died April 9, 1960 in Lowndes County, GA.
That doesn’t seem like the D.A. Morris you are looking for, but hope it helps. this andrew morris is my great great grandfather! does anyone know more info on him?